It is hard for me to believe that I am coming up 2 years as being page owner to Mused. There have been many ups and downs and I asked myself what kept me going when the going got tough. There were so many days that I did not feel adequate for the job. Days when typos and mistakes were the rule, days when I lacked energy and inspiration, and days when I wondered if anyone was following or would even notice if the page disappeared. What I have learned is that the page is like any other living work. It seems to have a personality and a will of its own. On the days that I felt like disappearing other page owners shared and kept it in the news-feed. On the days I lacked inspiration, I shared old posts. Most of the time, I just kept showing up and doing the work with a love for the audience and subject and things worked themselves out. As I created my latest art journal page, I contemplated how hard we as creatives psych ourselves out. Considering the mind and how powerful negative and destructive thoughts have in our lives, it is also important to see the flip side of that. When we become aware of this, we can choose for ourselves which thoughts we will allow to shape our destiny. A simple way to clear the negativity out is through mindfulness and meditation–it is now a favorite practice in my life. The more things that I have going, the more I feel I have riding on keeping things organic, simply, and pure. This is in part due to all of the issues that rear their ugly heads when failure/success looms. I need to be making my art.. running my pages… writing for the sake of the creativity/art itself. It is all too easy to get caught up in whether people “like” it or love it. Each post, each chunk of writing, each painting and journal page is a little piece of me–a documentation of an experience and/or thought in that moment of time. It may not have touched millions of people, but it expressed something that needed expressing at that very moment and acted as a catalyst to move me forward. Perhaps a painting wasn’t brilliant, but so what! It was the learning experience that was needed at that very point of time. As much as we love the practice of art/writing/creativity… we need to show ourselves that very love. Can we truly practice self-compassion? Why or why not? It is time to do the work on ourselves and develop insight and practices that treat our bodies/hearts/minds/spirits with gentility. It is survival. It is fuel to carry on. 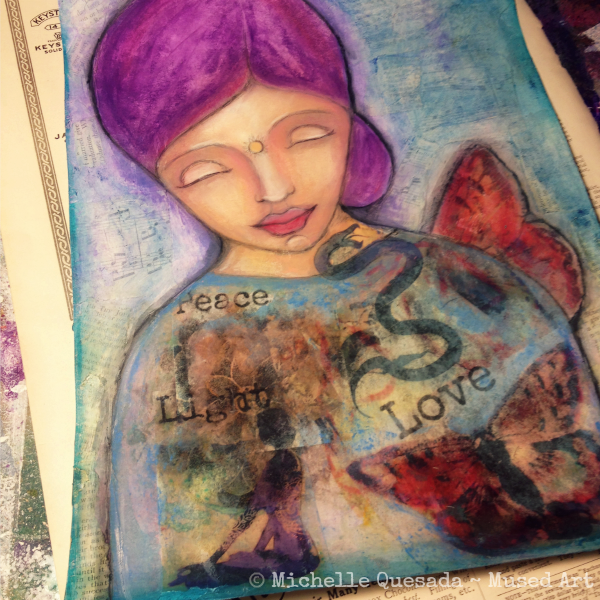 This entry was posted in Uncategorized and tagged art, compassion, creative blocks, creativity, failure, fear, journal art, love, mindfulness, mixed media, success. Bookmark the permalink. Lovely post, Michelle, and true in every instance. The world brings us high and low, what you have said is true of us all. You would certainly be missed. Beautiful piece of art, lovely words. Awww! Thank you so much. ❤ It is nice to hear that.